When I was young, I had a sort of ethnic identity crisis, as evidenced through my childhood “heroes.” My favorite Disney characters were the Chinese warrior Mulan, the gypsy Esmeralda from The Hunchback of Notre Dame, and the Native American princess Pocahontas. I idolized them and what they represented – strong female characters who made difficult decisions to stand up against the status quo. I had no idea what other girls my age saw in Cinderella or the other Disney princesses. No idea. The one exception to this ethnic identity crisis was Nancy Drew, the famous girl detective who is the subject of hundreds of books and countless movies and games in the United States. I do not know how many of these books by Carolyn Keene I read myself – but it was well over fifty. I found myself enthralled by the adventure and thrills of “The Hidden Staircase” and “The Sign of the Twisted Candles.” I immediately thought of my Nancy Drew obsession when I read the (perhaps somewhat sensationalistic) title of my book about Cambodia: Cambodia’s Curse: The Modern History of a Troubled Land, written by Pulitzer Prize-winning writer, Joel Brinkley. In 1978, Vietnam invaded Cambodia and removed the Khmer Rouge from power. While the removal of this regime was indeed a good move and brought stability to the country, it also put Cambodia in a sort of fix. 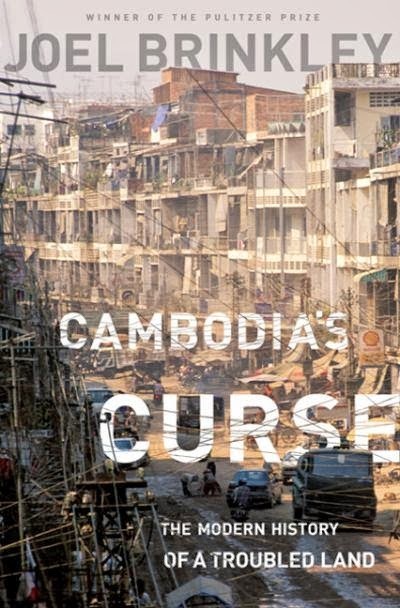 After the invasion of Vietnam, “Cambodia was stuck in a mire, occupied by its mortal enemy, represented before the United Nations and the world by its former genocidal government, governed by Communist dictators despised in the West, locked out of any significant assistance or aid. Cambodia had 7.7 million people in April 1975. Left when the Khmer Rouge fell from power were fewer than 5 million of them, and they were hungry, sick, and alone.” (page 59) Cambodia soon found itself caught in the web of strong political figures with a very weak democracy. The U.N. occupation and the U.N. sanctioned elections in 1992-3 could have only occurred in a post-Cold War environment (after the alignments of East, West, or Third World in the U.N. had fallen away), in an era of “a brave new world of comity and cooperation.” (page 70) Over 90% of the Cambodian participated in these elections, however, no party was able to gain control over the country – leading to a coalition government that eventually ended in 1997 by a coup led by Hun Sen, who is arguably the strongest political figure in Cambodia. Often referred to as a dictator, he is the current Prime Minister and head of the CPP, or Cambodian People’s Party and has effectively maintained control over the country since the Vietnamese invasion and 1979 victory. Another key figure in this saga was Ranariddh, who is a member of the traditional Cambodian royalty and head of the Royalist FUNCINPEC movement. He served as Prime Minster of Cambodia from 1993 until 1997, under the coalition government with Hun Sen, until he was overthrown by the coup. The opposition movement (which has received a great deal of support from the United States), embodied in the Khmer National Party, is led by Sam Rainsy.